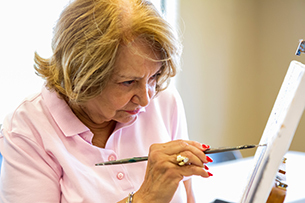 Creative therapies have demonstrated the ability to improve the quality of life for individuals living with Alzheimer’s disease as well as other forms of dementia. It stimulates the senses, and gets people talking about what they are seeing, listening to, or creating, and how it makes them feel. This mental stimulus triggers a variety of areas in the brain, which allows the individual to connect to memories and thoughts previously forgotten by the illness. 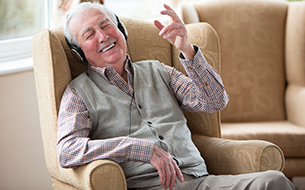 The benefits seen while the individual was listening to music carried over after the headphones are removed, allowing them to carry on conversations and remember things they were otherwise unable to. Researchers in Finland conducted fMRI testing to determine what areas of the brain responded when listening to music and found that not only were the auditory areas engaged, but many other neural networks participated as well. These included the motor areas of the brain, limbic areas which are associated with emotions, and the “default mode network” which is assumed to be associated with creativity and daydreaming. Music also stimulated areas involved with updating memory events, paying attention, and making predictions. Dopamine, a neurotransmitter which sends pleasure signals, is released when listening to music as well. Early stage individuals can help maintain cognitive functioning with music therapy, and those further into their illness benefit from the experience too. Despite the progressive nature of Alzheimer’s disease and dementia, the imagination remains intact. Allowing individuals the ability to create artistic works lets them express their imagination in a way that they otherwise may not be able to. Using artistic mediums like brushes, pencils, and clay encourages the use of motor skills and can help to recover these abilities, similar to a rehabilitation program. Creating art also helps to improve mood, promote relaxation, and provides an activity that can be done with family members who otherwise have no means of communication with the individual. At The Holiday retirement communities, we provide a variety of activities, programs, and excursions for our residents to keep them entertained and engaged. With the company of peers along with round-the-clock staff on site, no one ever feels alone. Our caring team looks after each of our residents like their own family. Give us a call at 860-233-8208 to learn more about the services and amenities we provide at our retirement communities in Rhode Island and West Hartford, Connecticut. Fill out this online form if you would like to book a tour.